A hearty soup that’s also healthy–perfect for a cold winter’s night or when you need a little comfort food. I think leftovers are great if they don’t taste like…well…leftovers! This recipe will make plenty of leftovers you’ll be grateful to have. Freezes well, too, although the recipe can easily be cut in half. Perfect as is or pair with corn bread or a crusty roll. 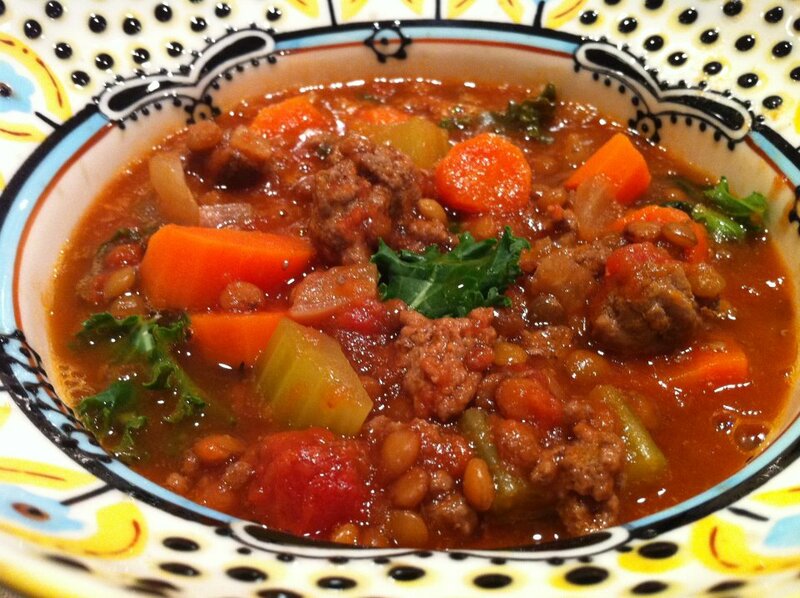 For kid appeal, just call it Hamburger Lentil Soup! Brown beef and onion in large soup pot or dutch oven. Add garlic and saute another minute. Add carrots through oregano, bring to a simmer and cook 45-60 minutes or until lentils are just tender. Stir in sugar, vinegar, salt, pepper, and kale, if desired, during last 10 minutes of cooking time. Slow cooker option: Brown beef, onions, and garlic. Transfer to slow cooker and add remaining ingredients, except the kale, as directed above. Cover and cook on low heat 6-7 hours or on high 3-4 hours, or until lentils are just tender. As slow cookers vary from model to model, check early so as not to overcook the lentils. Add kale during the final 15 minutes. I typically start with a quart of chicken stock, adding the amount the recipe calls for and reserving the extra to add to the leftovers. As the lentils sit, they continue to absorb liquid and extra broth or stock will ensure that your soup is as thick or thin as you like. This looks fabulous Ann. Have you tried cooking the whole thing in crockpot without cooking lentils first? Browning the ground beef first of course. Just curious. It is delish and is a crockpot meal.